Your surroundings not only impact your energy level and personal productivity; they can also affect your health, mental attitude and general well-being. For example, studies have shown that the presence of potted plants improves productivity, creativity, performance and learning ability. And researchers have also found that plants act as vacuum cleaners, removing pollution from the air. Exposure to indoor and outdoor pollutants in both home and offices has been linked to anxiety, depression, irritability, fatigue and short and long-term cognitive decline among other afflictions. One study involved new computers, which have been shown to give off chemicals into the air. When a batch of new computers were hidden behind a divider, cognitive testing showed it reduced performance and increased errors by those workers closest to the hidden computers. But those most distant from the computers were unaffected. Poor air quality can negatively impact both health and performance. According to the February, 2010 issue of Scientific American Mind, background noise at home, work or school can not only disrupt a person’s concentration, it could also increases stress levels and conditions such as high blood pressure, coronary disease, peptic ulcers and migraine headaches. Another study of more than 11,000 office workers revealed that interruptions caused more than two hours of lost productivity per day – that’s 25% of the workday wasted. This seems high, but an independent study by Basex in 2005 estimated that interruptions constituted 28% of the average knowledge worker’s day. Loud noises cause distractions and interruptions. But according to a peer-reviewed study out of the University of Chicago, “a moderate level of ambient noise is conducive to creative cognition.” Research carried out at the University of Illinois on the effects of background noise on creativity found that the level of noise experienced in a bustling coffee shop enhanced performance and even helped people concentrate. There’s a website called Coffitivity at https://coffitivity.com/ that lets you bring the sound of a coffee shop to your computer while you work. Coffitivity recreates the ambient sounds of a cafe to boost your creativity and help you work better. Background music, especially classical, has been shown to reduce stress, lower blood pressure and even help focus attention – so sound itself is not necessarily a distraction. I sometimes listen to AccuRadio on my laptop as I work. AccuRadio has over 50 genres including classical, blues, contemporary, Christian, country, and dance. You might check it out at Accuradio.com. Dull, boring offices and meeting rooms encourage dull, boring ideas. A Milwaukee insurance company claims that productivity jumped 15% after moving to a creatively designed building. Keep this in mind when creating an office area or other work area. Natural light from the sun is another environmental factor that can affect your health as well as your personal performance. It improves cognitive performance, alertness and mood. 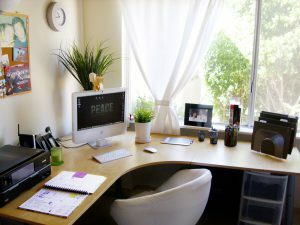 A University of Michigan study showed that people with windows facing the outside world are more productive, healthier, and are able to maintain higher levels of concentration. People in windowless offices – such as the common cubicle layout – daydream more. If you have a home office, working at a kitchen table may not be maximizing your personal productivity. Give more thought to where you locate your principal working area. Is there natural lighting? Ambient noise or music that encourages, rather than blocks, creativity? Adequate air circulation? Relatively free from interruptions? Pleasant, cheerful surroundings that include plants? How about a comfortable office chair and a stand-up desk as well so you are able to move around? Your environment is important if you are to maximize both your energy and your personal productivity.